Medea Playing with "Fluffy" - her Eyepet. Are your kids clamouring for a pet? Take them home an EyePet™ – the fully interactive and magical new creature for PlayStation®3 (PS3™) from Sony Computer Entertainment Europe. Cool, playful, and just bursting with fun and games, EyePet is your new family playmate, and he won’t make a mess or chew your TV cables! 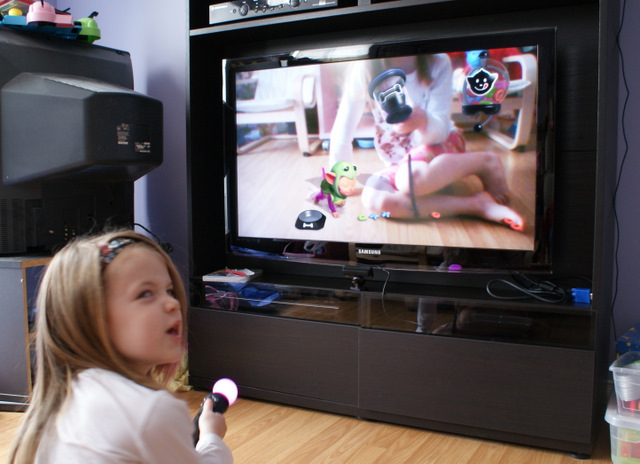 Interact with EyePet throughPlayStation®Eye, the interactive camera for PS3. PlayStation Eye will capture your surroundings and show them on your television screen, so your EyePet will appear in your very own living room. Call him with your Magic Card – a simple device that can create all sorts of fun and games for EyePet to play with – and watch as he hatches from egg and grows from a baby ball into a cub! Throw a ball and he’ll scramble after it, pat him and he’ll roll over for a tummy scratch. Use your Magic Card to select toys for him, including a trampoline, bubble-machine along with other fantastic toys to play with! See how EyePet can play and interact with his owners by watching the exclusive EyePet video here. By completing daily tasks, you can teach your EyePet brand-new games to play. The more he learns – the more exciting new tasks you’ll get to teach him! EyePet is fully aware of people in the room, and will play with you and your family in your home. Poke him and he jumps, stroke him and he’ll roll over in contentment, tickle him and he’ll laugh! Watch on as your youngsters play, learn and laugh with EyePet – just as if they would with a real-life pet. Kids and adults alike will love to customise him, dress him and see his various reactions: surprise him with a new toy, cheer him up when he looks sad or happy when you stroke him. …he learns by pictures Medea creates for him. Ontario’s play-based kindergarten curriculum emphasized the Arts as one of the six key learning areas. In this game, she creates art, and interacts with new technologies that can imitate and re-create it in augmented reality. This is taken one step further when the pet can interact with the art she creates! In this way, pretend becomes that much more real and the stimulus to continue is profound! The kindergarten curriculum emphasizes drawing, painting, singing, dancing, and pretending as elements of the Arts and this game has it all. Medea named her Eyepet “Fluffy” and he is very fun to play with. She dresses him up in different clothes on a regular basis and changes his hair colour and style, too. There are literally hundreds of outfits and combinations that can be used and more outfits are unlocked and awarded constantly by winning challenges. More on that in a second. As with other virtual pet games, it is necessary to keep your pet happy and healthy. Like real pets, the Eyepet needs attention and socialization. Medea knows that she must regularly check his status to see how he is and what he wants. The Eyepet Health Check is an x-ray scan of the pet’s internal status. A scan of the pet’s head indicates if he has had enough creative stimulus – if not, Medea knows that she must play some challenging games with him like “Snap”, or have him be artistically creative by drawing, singing, or dancing. In all three activities, Medea must show the Eyepet what to do and how to do it – she is the teacher. Prior to singing, Medea sings into the Move Controller (now a microphone on screen – the audio is picked up by the webcam) and Fluffy imitates her voice and melody. To dance, The Eyepet learns from the motions of the puppet Medea has created; to draw, he learns by pictures Medea creates for him. Ontario’s play-based kindergarten curriculum emphasized the Arts as one of the six key learning areas. In this game, she creates art, and interacts with new technologies that can imitate and re-create it in augmented reality. This is taken one step further when the pet can interact with the art she creates! In this way, pretend becomes that much more real and the stimulus to continue is profound! The kindergarten curriculum emphasizes drawing, painting, singing, dancing, and pretending as elements of the Arts and this game has it all. A scan of the heart also indicates if the pet is happy. An unhappy pet will just never do. To make her pet happy, Medea knows that playtime is necessary. She especially loves to play bowling with her Eyepet. Not only does play make the pet happy, but it also increases his exercise – another aspect she must pay attention to while playing (and another of the key learnings for the kindergarten curriculum); and, of course, the pet needs to eat. When hungry, his stomach scan will indicate such and she knows that it’s time to feed him. The nurturing and responsibility aspects of the game (Social development – caring for others), combined with artistic explorations are just a small part what the game offers when looked at as a learning platform. The challenges built into the game develop thinking and inquiry skills (some of the challenges are quite hard and problem solving is the key to being successful), promote language development ( reading, comprehension, procedural writing / lists), explore mathematical concepts (cause & effect, trajectory, speed, two-dimensions vs. three-dimensions, patterning, order), and science and technology (the Eyepet itself is a fascinating product of science and technology and how humans interact with it). After she read the list of instructions, I asked Medea to explain to me what she needed to do in her own word’s based on what she just read. This enabled me to check her comprehension. I want to walk you through the excellent learning that I witnessed while Medea was playing the game the other day. It was the 4th challenge of Day Eight in the Pet Program (there are 15 days and 4 challenges per day – prizes are awarded for having a successful day and trophies can be earned for challenges as well). Flutter By: This is another photo challenge. 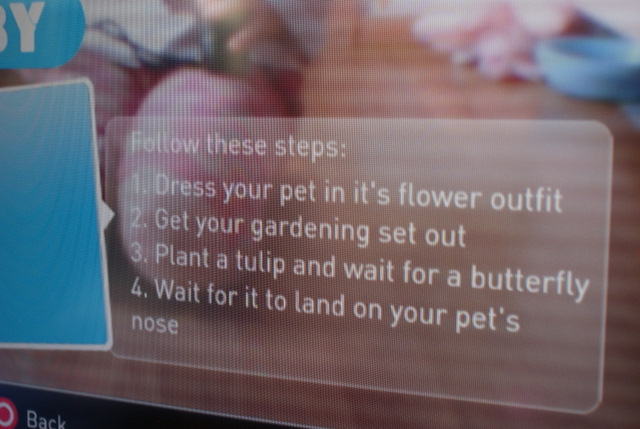 First off you need to put on your pets flower hat. Once you have done this get your garden set out and grow a flower. Then wait about a minute and soon you’ll see a bunch of butterflies on the screen wait for one to land on your pets nose and take the picture. This will give you gold and the trophy. The challenge is presented in a series of steps. I had Medea read them to me (great language development exercise, procedural writing / lists, different writing forms). After she read the list of instructions, I asked Medea to explain to me what she needed to do in her own word’s based on what she just read. This enabled me to check her comprehension. She explained to me what she was to do perfectly. Another great skill here is memory as she has to remember what step comes next after each step is completed (it does not remain on the screen). First, she had to go to the “Home” page where you can wash, style and dress up your EyePet. There she dressed the Fluffy in his flower outfit (NOTE: this outfit is only available if you completed a previous challenge. If a prior challenge is not completed, then later challenges can not be unlocked). Since the Eyepet uses the Move controller, Medea points at the screen and clicks buttons on the controller to complete motions. The hand-eye coordination necessary is combined with the previously learned knowledge of how to navigate the game itself. Each new skill is scafolded on the last. Frustration does set in periodically, so its good practice to encourage taking a break and walking around a bit so that frustration doesn’t turn into anger – thus defeating any good learning that could be taking place. Once dressed, Medea had to navigate out of the “Home” area and into the “Augmented Reality” portion of the game. She needed to remember that the Gardening set is located in the “Outdoors” area (we previously unlocked the gardening set in the first challenge of Day 7). Once in the “Outdoors” area, Medea selected the gardening set and Fluffy got ready for some gardening. There are a number of different seeds to choose from in the gardening area, so Medea needed to remember that she needed to plant a Tulip. If she planted any other seed, the challenge could not be completed. Fortunately, she remembered the right seed. Frustration does set in periodically, so its good practice to encourage taking a break and walking around a bit so that frustration doesn’t turn into anger – thus defeating any good learning that could be taking place. After planting, the seed it is necessary to water it. This is where the Move controller really shines! Once selected, the Move controller turns into a watering hose with a duck-head nozzle on the screen. Water sprays from the nozzle and, so realisitcally, fogs up the inside of the screen and drips down too. You’ll swear there is water in your TV! Talk about realistic pretend activities! There are multiple chances to succeed, as in all video games, and this is the power of them as learning tools. As the flowers grow, butterflies emerge and fly around the flowers. The next step of the challenge is here. To complete the challenge, Medea had to take a picture of a butterfly on Fluffy’s nose. Some patience is needed here. She had to figure out herself that Fluffy had to be close to a butterfly before it would land on his nose. Also, to take a picture, she had to click the “Start” button on the side of the controller (this activates the camera). Then, at just the right time, when the butterfly lands, she had to click the “X” button (this takes the picture). Medea Playing with “Fluffy” – her Eyepet. Fluffy shows the drawing to us – Good Job! The puppet comes to life! Curling up with Fluffy! Medea loves her Eyepet! Art Comes To Life – Pretend and Imagination Soar! What child hasn’t wanted her art to come to life. It does with Eyepet in a very cool and interactive way. In the Dance Moves challenge of Day 15, Medea needed to teach Fluffy how to dance using a puppet / marionette of her own creation. First she had to draw the puppet on a piece of paper. Next, we held the drawing up to the PS3 webcam and, taking the crayon in his mouth, Fluffy drew the same image on his paper. After showing the art to us (“Good Job, Fluffy!”), the puppet popped off the page, expanded to three dimensions, and attached to the Move Controller, now a holder for the puppet’s strings. Movement instructions appeared on the screen for Medea to follow, demonstrating dance moves to Fluffy who proceeded to dance for us. This ability to interact with a virtual pet in augmented reality adds an amazing sense of realism. It also gave Medea an immense sense of pride. Drawing something that became part of the game, and teaching her pet how to draw in the process, was further enhanced by the challenge created from it and the trophy earned as a result of the success. I am constantly amazed by her growing skill set and increased ability to solve rather complex problems. Another great example of art coming to love in an interactive way is the Balloon pop challenge of Day Eight. In this challenge, Medea had to draw an airplane (this time she chose to do it with the Move Controller on screen). When she was finished, the 2D drawing popped into three dimensions and Fluffy hopped on it, ready for a ride. The challenge started – this time she needed to pop 115 balloons to get this challenge at the gold level. The problem solving involved and the trial and error of plane construction (straight lines and precision are necessary for the plane to fly correctly – science & technology), combined with the challenge of actually playing the game and popping the balloons offer great learning experiences in the form of play. She even earned the “Stunt Pilot” trophy for her aviation skills! Every time I sit and watch Medea play Eyepet I am constantly amazed by her growing skill set and increased ability to solve rather complex problems. She looks after her pet very responsibly and nurtures it with care, love, and play. In her interactions with Fluffy, she is challenged to accomplish tasks that are increasingly difficult and broad in scope. The Eyepet truly covers the Six Key Learning Areas of the Ontario Play-Based Kindergarten Curriculum: Personal & Social Development, Langauge, Mathematics, Science & Technology, Health & Physical Activity, and the Arts. Sony markets the Eyepet as magic and I totally agree! For more on how video games should be seen as a model for best teaching strategies, see this excellent artcile by Judy Willis, “ A Neurologist Makes the Case for the Video Game Model as a Learning Tool“, at edutopia.org. In humans, the dopamine reward response that promotes pleasure and motivation also requires that they are aware that they solved a problem, figured out a puzzle, correctly answered a challenging question, or achieved the sequence of movements needed to play a song on the piano or swing a baseball bat to hit a home run. This is why students need to use what they learn in authentic ways that allow them to recognize their progress as clearly as they see it when playing video games. I love this Eyepet post! Before reading your post, I knew nothing about the PS3 or about an Eyepet, but after reading it, I’m thinking that every Kindergarten class needs one of these. What a great way to link technology, literacy, and social skills in a really meaningful way too! I bet my Grade 1’s and 2’s would love a pet like this too! I love when learning can be fun, and this is exactly what this Eyepet allows for: fun learning! Thanks for sharing your daughter’s experiences here! Your Grade 1′s and 2′s would certainly find the game fun and rewarding as the challenges increase exponentially as the game goes on. Where Medea struggles with some of the concepts, the slightly older students would have an advantage of previous learning and experience. I’m thinking that students could blog about their experience with the Eyepet, either in reflection or to make predictions for how challenges would play out and what would be necessary to be successful. Great material. I think you point out two important ingredients of effective game-based learning; an engaging, interactive experience that uses thinking/ executive functioning skills and an adult who mediates the learning process to connect it to the real world. Great games require less of parents and teachers to generalize skills to the real world and fortunately we are starting to see more of this type of interactive game. We are working on a game-based curricula for teaching executive functioning, currently designed for elementary and middle school students, but have plans to adapt it to high school students.